1. Prepare cake according to package directions. Bake and let cool approximately 15 minutes. 3. Pour sweetened condensed milk over cake allowing it to flow into the holes. 4. Pour caramel topping over cake allowing it to flow into the holes. 5. Spread whipped topping over the entire cake. 6. 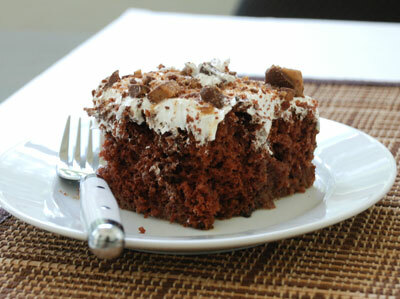 Sprinkle crushed candy bars over whipped topping. Refrigerate.